We’v e been telling you a lot about our variety of carton flow rack mounting brackets in our recent blogs and resource pages. Well now we have a smart new bracket redesign that that will help you save time, money and replacement costs…. Mallard’s new Dyna-Flo bracket retention angle provides a hassle-free, hardware-free way to prevent the carton flow track from shifting left and right while cartons flow down the lane. Unlike the previous bracket, this piece simply requires an adjustable wrench rather than two nut and bolt assemblies. 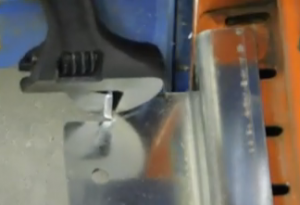 What are the benefits of the new retention angle assembly? 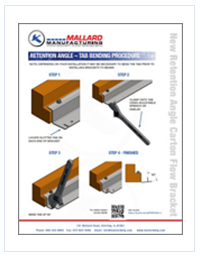 Here is a link to our downloadable PDF with bending instructions and pertinent illustrations. The PDF features a QR Code that will connect you directly to the video and allow installers to view the tab bending procedure. 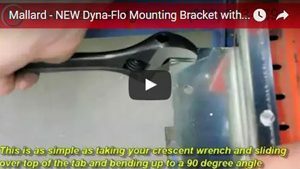 Contact us and let us know what you think about our custom carton flow racking mounting bracket line and especially our new Dyna-Flo retention angle mounting bracket.